When, (Year 11 student), Lucy pitched her production proposal to the Theatre Committee in May last year, there was palpable excitement and expectation from all who heard her ideas. Not only was it clear that the themes within the play would reflect and address some important social issues affecting teenagers today, it was also thrilling to know that Clayesmore Theatre would be producing another student-led dance piece. The production did not disappoint! Running for two nights, the director (and her cast and crew) were over the moon to have two completely ‘sold-out’ evenings! This was a testament to how much word-of-mouth excitement had been generated by the social-media-savvy publicity team! The audience were also treated to a different kind of viewing experience, as the auditorium was transformed into a cabaret-style, jazz club, complete with carpets, comfy armchairs and candles. The production follows the story of ‘Boy’ (played by Year 10 student Alfie) who is dealing with mental ill health. At the beginning of the production, it seems that all hope is lost for ‘Boy’ until he ironically and tragically falls in love with the personification of ‘Death’, played with expert attention to detail by Louise (Year 9). 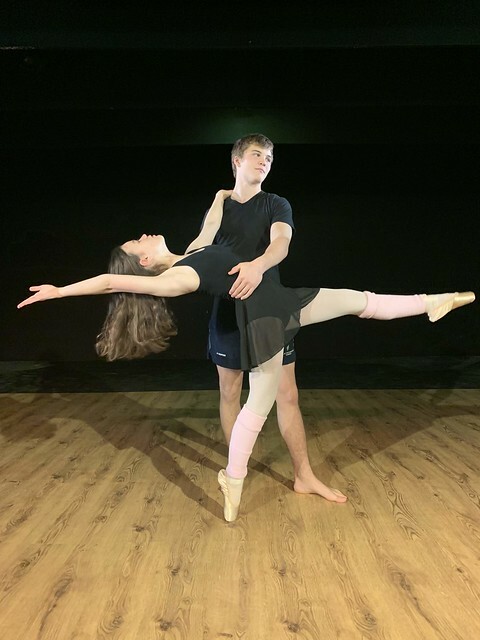 The two characters demonstrated their love for one another beautifully via some wonderfully slick choreography, until ultimately ‘Boy’ has a decision to make. I won’t spoil it, but will say it was rather sad. The cast and crew approached the subject matter sensitively and in a way which explored the pressure felt by teenagers in contemporary society, whilst also recognising the different decisions the protagonist might have taken throughout the piece. The creative arts are such important spaces when it comes to discussing issues like this. I am sure that many audience members, (a great number of whom shed a tear or two), will have left the theatre wanting to speak about the issues faced by ‘Boy’. As with every production at Clayesmore, it involved a lot of hard work from an awful lot of hard-working students. From the lighting and sound designers, to the stage-management team; the make-up department to the students manning the front of house, it is very much a team effort. They must all be commended on what was a sensational production. Very well done!